So I thought it might be fun to add a new bit onto the blog about etiquette and easy ways to help you make your way through potential awkward situations. It happens! Today, we’re talking about how to eat in a formal dining situation. If you’re like me, then you don’t end up in a situation where you’re looking at a table where it looks like any of the images to the right. In this day and age, setting a table to look anything like the right typically doesn’t happen. While women regularly attended finishing schools years ago, we no longer hold this practice. Which means we are missing out on a lot of the things that they were taught. To me the image to the right isn’t completely foreign. As a member of a women’s fraternity, any big breakfast/brunch/lunch/dinner we attend that is put on at a big fancy place usually comes with some type of setting on that image. Like I will not kid you. My first NAAC AOII Founder’s Day that I attended had the brunch setting and I had absolutely no clue what I was doing. Thank the lord for my sister who was there that had gone through cotillion because otherwise I would have been lost. So I wanted to give you a simple help out that should get you through any formal occasion. Because sometimes, we like to get dressed up and look pretty! And no, it is not to start from the outside and work your way in. Easy! Your right. As most people in the world are right handed, your glasses will always be to your right unless you have someone who’s a lefty and sets their table opposite. Also, don’t feel wrong to ask! I always ask because these brunches happen early on a Saturday and a formal place setting is not where my mind is on a Saturday morning full of Panda time. So I will ask someone if I know they know what the proper side is. And sometimes you have a brief moment of clarity and remember what it is and start teaching everyone what side it is at your table. It comes with territory of when you have the knowledge. Okay I might have lied. Yes, I’m going to tell you it is okay to start on the outside and work your way in with your silverware. Your salad fork will always be the outermost fork. Unless you’re having some type of food that calls for the itty bitty forks. Then that will be on the outermost on your left. Now sometimes, if it’s a super formal setting, there will be a fork on your right. Pause and take a moment. In a huge formal setting when you’re having a multiple course meal, it happens. This is your seafood fork, not to be confused with your fish fork. It’s honestly not that daunting to me, but then again I memorize things like crazy. 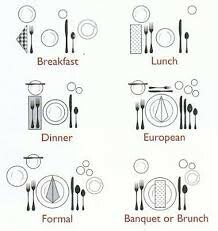 But the easiest way to remember a lot of this is that if there are multiple courses, then your plates will correspond with the silverware to some degree. But please for the love of all that is beautiful in this world, take your napkin and put it in your lap before you start eating. You will look like a fool if you don’t. I won’t lie. The first thing I do when I go out to eat – even if I’m by myself for lunch like today – is take a napkin and put it in my lap. This will keep you from wiping your hands on your skirt/pants/dress and catch crumbs if you’re like me and you’re stuck unable to move your seat closer because you are short. Wait! I wasn’t done eating! Well think about how you left your silverware on your plate. 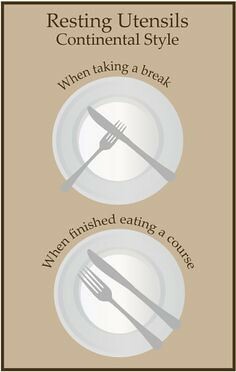 If you’re not finished eating, then rest your fork and knife on the plate on either side or almost in a slight X formation as depicted in the image to the right at the top. This signals to your waiter/server that you are not finished and are only pausing for a break. This is also a natural movement as you should hold your knife in your right hand and your fork in your left hand for formal meals. 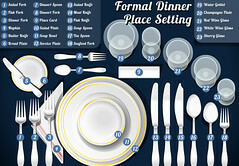 To show that you are done, then you will sit both the fork and knife parallel next to one another on your plate as depicted in the bottom of the image to the right. These should go without saying so I’m just going to simply put these in bullet points. Do not reach across the table for the salt, pepper, or anything. Do ask someone to pass them to you. Passing should be done clock wise or right to left. Do not have a heavy hand when pouring gravy or dressing onto your salad. Do make sure you save some for others. Do politely signal for a moment as you finish the food in your mouth. Do not lay your silverware on the table. It’s just nasty. Do rest your silverware that is being used on your plate. There are probably a million other things I could add to the list but these are pretty much the big don’ts of formal dining – at least in my experience. I hope you all have a very happy Friday Eve and I will be back tomorrow with another new post!